1880 was the first year humanity had the capability to measure the average global temperature; 2014 was the hottest year since. 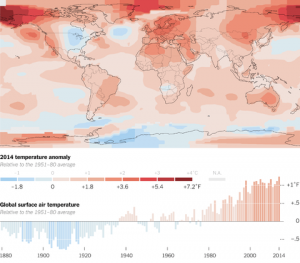 According to NASA and National Oceanic and Atmospheric Administration (NOAA) scientists, 2014 was the warmest year on record. Except for one year back in 1998, the last 10 warmest years were after the turn of the millennium. The average global surface temperature has increased by about 1.4 degrees Fahrenheit (0.8 degrees Celsius) since 1880, largely due to carbon emissions and other pollutants released into the atmosphere, with most of that warming occurring in the last 30 years. “This is the latest in a series of warm years, in a series of warm decades. While the ranking of individual years can be affected by chaotic weather patterns, the long-term trends are attributable to drivers of climate change that right now are dominated by human emissions of greenhouse gases,” remarked GISS Director Gavin Schmidt. Regional differences in temperature are more strongly affected by weather dynamics than the global mean. For example, in the U.S. in 2014, parts of the Midwest and East Coast were unusually cool, while Alaska and three western states – California, Arizona and Nevada – experienced their warmest year on record, according to NOAA. NOAA team used mostly the same raw temperature data, but used an alternative algorithm to interpret the information.